The brain requires a variety of micronutrients in order to produce the chemicals that help keep you relaxed and in a positive mood. Stress tends to bring us down and it also depletes the body’s storehouse of vitamins, amino acids, and minerals that support energy, mood, and sleep. When you are feeling low, you need to feed and nurture your brain with Happy all-natural formula from DocFlowers. Our Happy mood booster uses a blend of all-natural an effective formula. Our proprietary blend of natural ingredients works harmoniously to calm your mind, lift your mood, and provides daily relief from anxiety, stress, and even depression. It also helps to boost the levels of melatonin, enabling you to sleep better during the night. Providing superior quality to our clients in an ethical and sustainable manner is our pride. Happy mood booster is manufactured in certified GMP facilities in the United States. Our products are made using soy-free, non-GMO, and cruelty-free ingredients. At DocFlowers, we are big believers in the community and we always make choices that are good for the people and the environment. Every product that you buy from DocFlowers will help to improve the nutrition of a woman, man, or child. Making the best mood enhancing supplement requires sourcing for the best ingredients. 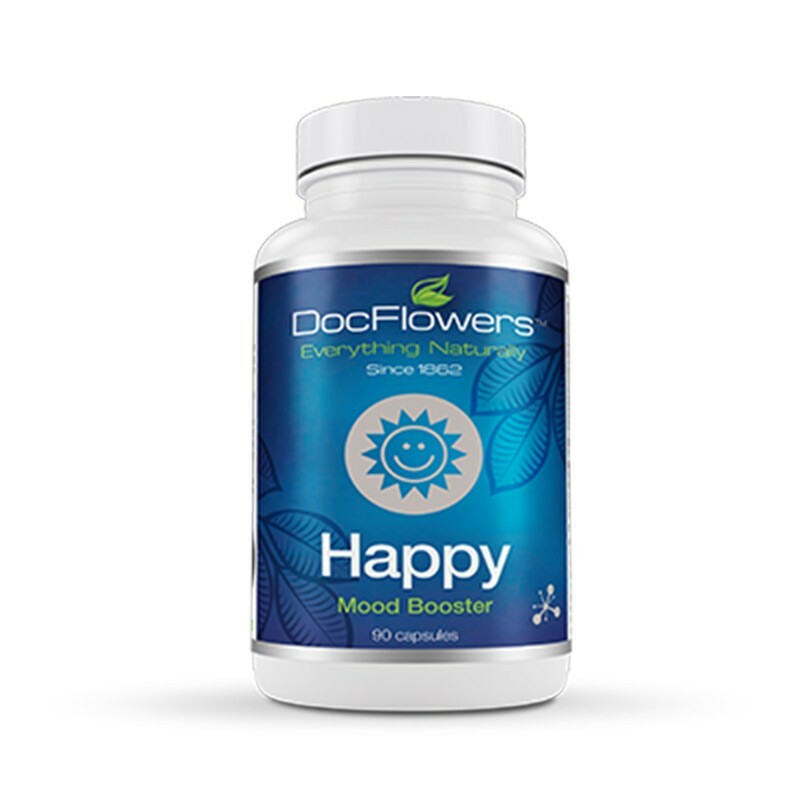 DocFlowers’ Happy is made using all-naturally sourced and sustainable ingredients including St. John’s Wort, ginger root, passion flower, bupleurumfalcatum root powder, lobelia powder, ginkgo biloba powder, gotu kola powder, ashwagandha root, licorice root powder, schisandra berry powder, valerian root, wild mint leaf, dong quai powder, lemon balm, wood betony herb, and ginseng (panax) powder. With happy mood enhancing supplement, there are no side effects because ingredients used are all-natural. The capsules inside the bottle are plant-based, vegan capsules that do not contain any gelatin from animal products. Additionally, our Happy is 100% non-GMO and is allergen-free as it does not contain soy, gluten, fish, nuts, egg, soybeans, yeast, sugar, yeast, and corn. Our Happy mood enhancing supplement helps to support the production of the neurotransmitter serotonin. When you have a balanced level of serotonin, it will boost your general mood and this can enhance your wellbeing and make you less stressed out. Maintaining a healthy and stable level of serotonin with the use of mood-boosting supplements like Happy can enable you to maintain positive moods every day.